Growing out your gray hair can be a huge, daunting decision. You may be afraid of how your curls, coils, waves, and locs will look with gray strands. You may be afraid of looking “older” and standing out from the crowd. Gray hair is definitely a personal preference, but it does not have to be as frightening as it seems. To start, really take the time and ask yourself why you would like to grow out your gray hair. Are you ready to accept your gray strands? Do you love the way your gray strands look? Do they make you feel proud and confident? Are you tired of scheduling appointments with your stylist for your color treatments? 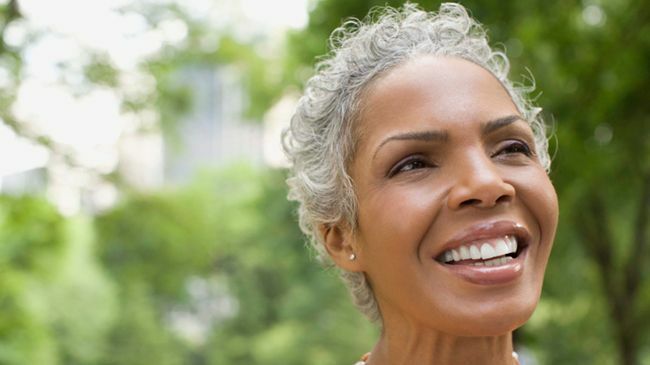 Asking these questions can really help you get to the root of the problem about why growing your gray hair is intimidating for you. There are many benefits to growing your gray hair out. It can save money since you would not have to visit the salon for color treatments. Taking care of color is costly and also time consuming, which leads me to the next benefit, it saves time. Your appointments at the salon will be shorter since you would not be coloring your hair. This also applies to DIYers since you would not have to spend the time touching your color up with boxed hair color treatments. In addition, gray hair will make you stand out. The color is bold and will make a statement. A lot of people will stop and stare, but for a good reason. It is time for you and your silver crown and glory to shine. Lastly, these gray strands are you. They reflect the experiences that helped you grow and become the strong person that you are. Those gorgeous gray locks can be a great reminder of those experiences. There are many photos of women who are embracing their gray strands on social media, like these 8 gracefully gray curlies. Notice how they style their hair and how the gray hair flatters their face. It is time to get your social media on! Create a board on Pinterest and post pins for inspiration. Observe their confidence and how they embrace their strands. This can help you with your process. Need more inspiration? Make it a group effort with your friends. Challenge your friends and go through the process together. The love and support of your friends and family can definitely make it easier. Document your progress with photos to capture the experience. Not sold yet? Look around you, silver hair has become a trend. Silver highlights and full hair colors have hit the streets and a lot of people are participating. But we all know that gray/silver hair has and will always in vogue. What are some ways that helped you grow your gray hair out? What are some encouraging words to those that are unsure?